Sharing the dream story of Sai Devotee Ankit. Reproduced in the own words of Ankit, this write-up is overwhelmingly sweet and packed with innocence and purity.Treat your eyes! On Thursday 08 January 2015, I had an exceptionally beautiful dream of Sri Sathya Baba which I am sharing with all our friends and Sai devotees. In the dream I see my friend and I with so many devotees standing in a very big hall of a temple. This temple is surrounded by so many trees and is situate in a jungle. We are feeling so much peace and sacred vibes all around the temple. In this big hall of temple there is a big tree and under the tree there is a very beautiful statue of Sri Sathya Sai Baba. Near the tree and the statue there is room that is closed from inside. All the devotees are standing there with so much impatience and waiting for someone who is inside the room. Only my friend and I don’t know who is inside the room but other devotees know who is inside. After few hours of waiting the door is opened by someone who is inside the room. My friend and I feel that this person is sitting in a deep meditation from long times. When he opens the room from the room so much sacred smoke of ‘dhoop’ or smoke of ‘agarbatti’ comes out from the room with this man. However we do not see very well this man’s face. We are still trying to recognize who is this man when this man completely comes out from the room. We see his face and this is what we see … He is our Baba Sri Sathya Sai Baba himself in orange color robe looking so sweet and beautiful. In his one hand there is ‘aarti thali’ and he starts to do ‘aarti’ facing to the room door . Then one person, who is standing near to us, says that Baba is doing ‘aarti’ of his own guru first. After this ‘aarti’, Baba faces to the tree and his own statue Sri Sathya Sai Baba and starting to do ‘aarti’ and Baba is singing the aarti song and all the devotees are following to Baba in chorus and all are singing the ‘ aarti’ song. Then a man who is very small in height took a “ganti’ (cymbal) in his hand and start to play the “ganti’ with a stick and same time he is dancing from left to right in ecstasy. We can also hear the voice which is coming from the statue when Baba is talking to the statue. Baba says so many times to us that Yes I can talk to my statue! Yes I can talk to my statue! Yes I can talk to my statue! After this, Baba turned to face His devotees and blessed us all with one hand raised. Then my friend and I look into the eyes of Baba and we see a wonderful vision of Baba. We see the whole world in His eyes! For us, it is a very special darshan of the Lord! 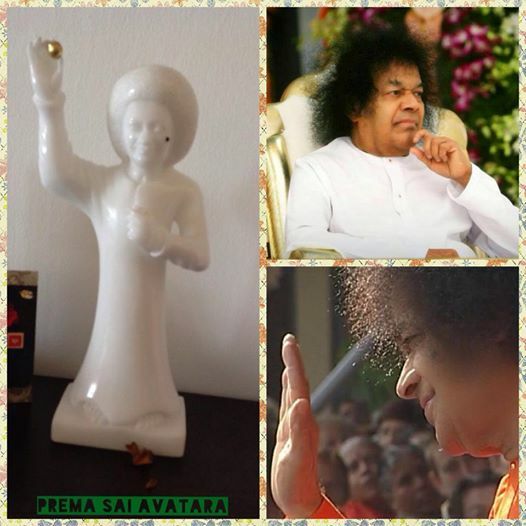 This entry was posted in Dreams, Experience of a Sai Devotee, poems and quotes, Poetry of Anita Bacha, Sathya Sai Baba, Short story, Statue and tagged Dreams, Experience of a Sai Devotee, Poems and Quotes, Poetry of Anita Bacha, Sathya Sai Baba, Short Stories, Statue by Anita Bacha. Bookmark the permalink.